A detective mystery is a great party game to organise for a birthday. Children love the idea of playing the role of little detective and setting off in search of the culprit. When organising a detective mystery with a group of children, first of all decide on the premise for the investigation. This could be a murder, a kidnapping or the theft of an artwork from a museum, for example. Next draw up a list of suspects. On a piece of paper, draw up a list of 8 potential suspects including, of course, the guilty party in your great detective mystery game. For each suspect, think up a name, profession, age, physical description (eye and hair colour, height, build, etc. ), a motive (a reason for committing the crime), etc. If your list is made up of 8 suspects, you will need to think up and prepare 7 clues, each of which will clear one of the suspects on the list. Here are a few examples of clues to create: rebuses, charades, riddles, secret codes, anonymous letters from witnesses, etc. You will need to adapt the difficulty of the clues to the age of the children participating in the activity. This is the most lengthy stage in preparing a detective mystery game and will determine its full duration. Once they have solved the last clue, the children will have just one suspect left on their list: the culprit! Find places to hide the clues in the location of the big event. You will need a hiding place for each clue (under a bed or rug, in a book, etc.). As with the clue difficulty, their hiding places will also have a direct bearing on the total duration of the game. Story outlining the premise for the investigation: invent a story of a murder, kidnapping or theft, etc. Suspect list: prepare a sheet with the culprit and the other suspects in the investigation. Clues: each clue will clear and rule out one of the suspects in the detective mystery. Hiding places: decide on a hiding place for each clue. The game ending: write a few lines congratulating the detectives and explaining, for example, why the suspect committed the crime. Children love playing the little detective, and detective mysteries are a slightly different take on the treasure hunt, especially with children over 8. They will prove a great success for your child’s birthday party. 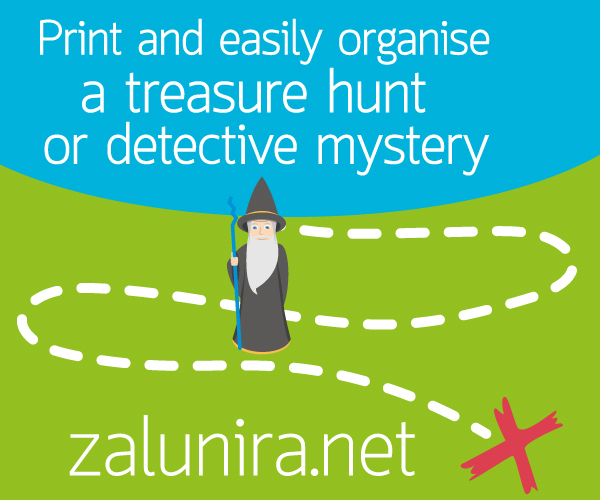 If you don’t have the time to prepare such an activity, you will find ready-to-print detective mysteries on my site, zalunira.net. So, perhaps I’ll see you soon!